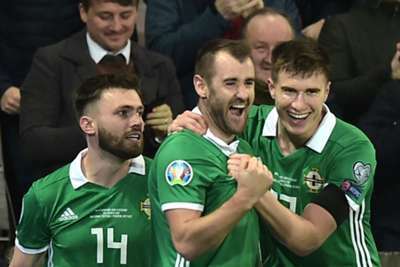 Northern Ireland got their Euro 2020 qualification campaign off to a fine start as goals from Niall McGinn and Steven Davis were enough for a 2-0 win over Estonia. With Germany and Netherlands also present in Group C, it was imperative Michael O'Neill's side got off to a strong start and they lived up to expectations with a dominant display in Belfast on Thursday. Paddy McNair's dreadful miss summed up Northern Ireland's frustration in the first half, but McGinn's first international goal since Euro 2016 broke the deadlock after the restart. And with Bailey Peacock-Farrell having made a superb save to keep the hosts' lead intact, Davis made sure of the win from the penalty spot as Northern Ireland joined Netherlands in making a winning start in the pool. Northern Ireland should have been rewarded for a positive start in the 19th minute, but McNair somehow headed into the ground and over a gaping goal from three yards out. Jamal Lewis had a penalty appeal turned down as the hosts maintained the pressure, with Jordan Jones drilling just wide soon after. Northern Ireland finally had their lead in the 56th minute, though, Kyle Lafferty laying the ball off for McGinn to slam home through a crowd of players. McNair could have atoned for his earlier miss eight minutes later, only to head over once more, and Northern Ireland would have been made to pay had Peacock-Farrell not denied Henri Anier from point-blank range. That save paid further dividends four minutes later when Karol Mets scythed down George Saville – Davis making no mistake from 12 yards to make sure of Northern Ireland's first competitive win in nine matches. Northern Ireland endured a frustrating UEFA Nations League campaign, putting in a string of promising performances without the results to match. Once again, they failed to make the most of some good chances presented to them, but on this occasion they found the quality to make a breakthrough. The young goalkeeper has been unfortunate to lose his number one spot at Leeds United in recent weeks, but despite having little to do at Windsor Park, came up with a vital save when it mattered to maintain Northern Ireland's lead. Northern Ireland's win would have been a lot more comfortable had former Manchester United man McNair made the most of two clear-cut chances, but fortunately for the midfielder, Estonia failed to take advantage of his wastefulness. - Northern Ireland picked up their first win in nine competitive matches (D1 L7) since beating the Czech Republic in September 2017. - Michael O'Neill's men have now won their opening match in each of the last three European Championship qualifying campaigns. - Estonia have never kept a clean sheet against Northern Ireland in five previous meetings, failing to score themselves in three of those games. However, this was the first match they had conceded more than once against them. - Niall McGinn's goal was his first in 13 appearances for Northern Ireland in all competitions, since scoring against Ukraine in EURO 2016. - Ten of Steven Davis' 12 goals for Northern Ireland have been scored in home games. Northern Ireland face Belarus in their next qualifier on Sunday. Estonia, meanwhile, take on Gibraltar in a friendly in their next outing.